February 27 is the 81st anniversary of the death in action at Jarama of the Irish poet and Lincoln Brigadista Charlie Donnelly. At the 80th anniversary commemoration in Donnelly’s natively village last year, ALBA Board Member Nancy Wallach met with Nora Shovelin of the Clé (Left) Folk Club, which meets each month in Dublin’s Liberty Hall, HQ of Ireland’s largest labor union, SIPTU. Nora learned of Nancy’s previous lectures on the solidarity of Paul Robeson with the International Brigades, which she had delivered in Belfast’s Shankill Public Library in August 2016, and at New York University’s Tamiment Library in December 2016. Would she be prepared to tailor a similar lecture for a Dublin audience? 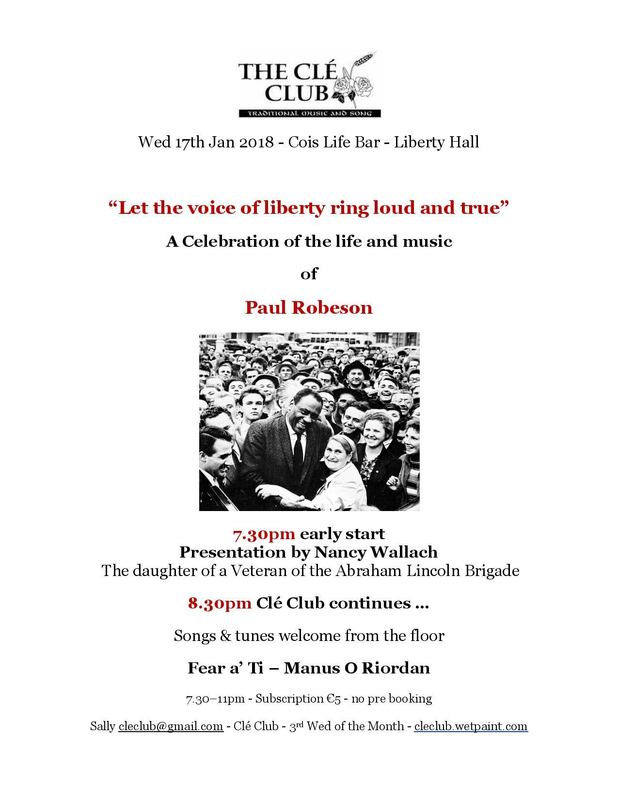 “Let the voice of liberty ring loud and true” – A Celebration of the life and music of Paul Robeson, was the title of the illustrated lecture accordingly delivered by Nancy Wallach in Liberty Hall this past January 17. On the previous evening, both Nancy and I were the guests on Dublin Northside Community Radio, on a 90-minute program hosted by City Councillor and former Deputy Lord Mayor, Larry O’Toole. Interspersed with recordings of Paul Robeson’s finest singing, Nancy told the story of both Robeson himself and the International Brigades, while we each also spoke of the personal experiences of our own Brigadista fathers. Among the listeners who texted in during the course of that live broadcast, expressing their appreciation of the program, was the Lord Mayor of Dublin, Micheál Mac Donncha. On January 29, the internationally renowned singer/songwriter Christy Moore gave yet another of his sell-out concert performances. A Patron of the International Brigade Memorial Trust, Christy’s song “Viva La Quince Brigada!” Is a central feature of his repertoire. Christy announced the presence of two Brigadista children in that evening’s audience, and he dedicated his rendition on this occasion “to the memory of two International Brigade volunteers, Micheál O’Riordan of the Connolly Column, and Hy Wallach of the Abraham Lincoln Brigade”. See here for the Irish National TV News film clip which, at the close of the report, shows Nancy Wallach lighting that candle. See here for “Viva La Quince Brigada!” by Christy Moore. See https://www.rte.ie/news/ireland/2018/0128/936510-holocaust-memorial-ceremony-to-take-place-in-dublin/ for film clip of Nancy Wallach lighting a candle for the political victims of the Holocaust, if technical difficulties with this link on the blog itself. See also https://www.scrapbookpages.com/Mauthausen/KZMauthausen/Liberation/index.html for the liberation of Mauthausen concentration camp prisoners, including Spanish Republicans, by the US Army in May 1945. Includes iconic photos.